The Spiral Knights Crusaders are not ready for Tier 2 Graveyards. They’d fit in perfectly hangin’ out at the local mall near the Hot Topic, chillaxing the day away. As I lay on the ground in my Ash-tail Coat, wondering if I really could have held off the phantoms on my own with my Freezing Atomizer—I would really have had to play bomb knight, Heavy Demo suit and all at the very least, not go back down the route of swords again during team play; I’m still resistant to My True Path—well, I think it would go down better with a Shivermist Buster. But the Spiral Knights Crusaders are the epitome of the Three Musketeers: All for one and one for all. Though I tried to convince them to leave me behind to deal with the phantoms so they could get to the gate and thus automatically bring me with them to the next level, they weren’t about to leave me to the phantoms. And so we all died together, because we don’t have a cohesive plan for this level. 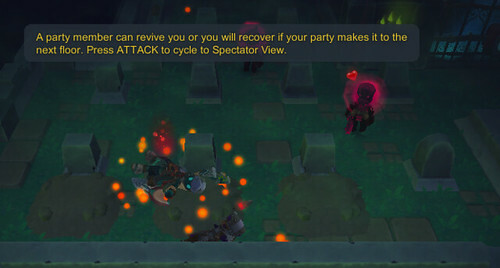 And so while “phantom duty” is certainly one method to solve the problem of teaming up in a Tier 2 graveyard, we’re going to find another solution. But for sure it’s going to involve better equipment. You’d think we’d have better stuff by now, but we’re hour-on-odd-days casual players, and move at a slower pace (when we’re not buying stuff with crystal energy… at least, I’m the one who does that, although I’ve stopped for now).